Despite the, what I hope to be evocative, locations in Undercroft City and Reliquary that make up the city of Frankylmoign that I've laid out earlier, it is the Lychgate that I hope to be the centre stage of this particular setting and, unlike the two mentioned previously that could have long term campaigns set in them, would be a one time event. Traditionally, lychgates tend to be the small archway entrances into the churchyard, but of course, for this major landmark on Glebe IV, it would have to be much bigger, more grandiose and, of course, baroquely gothic. 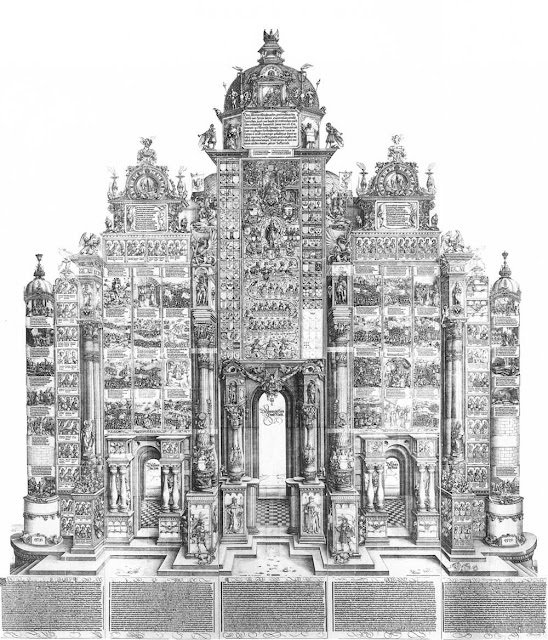 I instead looked at triumphal arches for inspiration as they also have a connection with the dead (normally as grand tombstones marking a special grave site) and found a very detailed drawing of the Arch of Maximillian I by Albrecht Durer that is simply spectacular and very fitting for the 41st Millennium.